The National Senior Certificate (NSC) is a 130, credit NFQ 4 certificate issued for the first time at the end of 2008. Higher Certificates: National Senior Certificate (NSC) with a minimum of 30% in English as certified by Umalusi. Diplomas: National Senior Certificate (NSC) with a minimum of 30% in English as certified by Umalusi and an achievement rating of 3 (Moderate Achievement, 40-49%) or better in four recognised NSC 20 credit subjects. Degrees: The minimum admission requirement for the Bachelor degree programmes requires a National Senior Certificate (NSC) with a minimum of 30% in English as certified by Umalusi and an achievement rating of 4 (Adequate Achievement, 50-59%) or better in four subjects from the designated subject list: Accounting, Agricultural Sciences, Business Studies, Dramatic Arts, Economics, Engineering Graphics and Design, Geography, History, Consumer Studies, Information Technology, Languages (two other recognised language subjects), Life Sciences, Mathematics, Mathematical Literacy, Music, Physical Sciences, Religious Studies, Visual Arts. Higher Degrees: A relevant B-degree or Honours degree. In addition, further admission requirements may be specific to certain programmes. A Grade 12 Certificate with university exemption (endorsement) is required to register for degree studies. Any certificate, which is deemed equivalent and which is registered on the NQF. The senior certificate must reflect a minimum of five subjects in higher or standard grade or combination of subjects on the higher grade and the standard grade. The Academic Board may admit a person with a senior certificate with a minimum of four subjects (which may not include more than two of the official languages) passed on higher or standard grade, provided the remaining subject/s passed on lower grade is/are not a prerequisite for the proposed instructional programme. If one of the official languages is passed on lower grade, or you do not meet the above requirements, the student will be obliged to apply for conditional admission. Where an applicant is at least 23 years of age on the date of registration and is in possession of a Standard 8 or Grade 10 Certificate or equivalent qualification and possesses work experience as a manager or supervisor, s/he may apply for conditional admission to Southern Business School. Should a student be granted conditional admission towards the Higher Certificate in Management, s/he may register for only two (2) subjects in the first semester. If the student passes these two subjects on the first attempt, conditional admission is revoked and the student’s status migrates from ‘conditional admission’ to ‘normal registration’. Should a student fail to pass both subjects on the first attempt, s/he will not be allowed to continue his/her studies at Southern Business School. Where a student did not acquire appropriate learning in a formal or structured non-formal manner, s/he may apply for recognition of prior learning. Where informal and/or non-formal and/or experiential learning took place it may lead to formal recognition. Contact Southern Business School for the necessary application forms. Students may apply for exemption from subject/s obtained from other registered Higher Education Institutions. The Academic Board of Southern Business School will consider applications and their decision is final. A maximum of six subjects may be exempted on degree/diploma level, a maximum of two subjects on Higher Certificate level and two (2) on Advanced Diploma level. A maximum of 65 credits may be exempted on Honours Degree level. A certified copy of your Grade 12 (matric) Certificate, National Senior Certificate or any other qualification obtained. A letter from the student’s employer verifying a minimum of two years work experience in the field of study. No qualifications will be issued unless the required documents are on record at Southern Business School. You may be interested in reading about the benefits of studying distance learning at Southern Business School. Select a qualification: Whether you are a prospective graduate, undergraduate diploma or certificate student, Southern Business School is rich in opportunities for students intending to study in the field of management. Select from various formal undergraduate and graduate programmes. Read about the qualifications on this website or download the Southern Business School Information Sheet, which is attached below. Consider the minimum admission requirements and the qualification-specific requirements, which are detailed in the page about each qualification. Did you notice that you may be granted exemptions? Obtain recognition for prior learning and be conditionally admitted to a qualification? The closing date for first semester registrations is mid February, for the semester spanning from January to June. The closing date for second semester registrations is mid July, for the semester spanning from July to December. Now you should be ready to complete the registration form. If you prefer to receive this form by post or email, let us know by clicking on Contact at the top right of the page or contact SBS at 011-662-1444. Other files that you should download include the debit order form and a student application form. 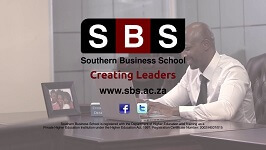 If you are from South Africa, or any other country, use the Southern Business School forms. Please note that the Namibian forms are only intended for Namibian students.